Reputed to be one of the most prolific salmon rivers on earth the Miramichi system offers the salmon fantastic breeding habitat and the angler some wonderful fishing. Fishing camps are dotted all over the river, legends and stories abound, if any community has become totally immersed in salmon folklore it is that on the Miramichi. In Doaktown the Atlantic Salmon Museum provides a focus for the salmon history and heritage of the area, public awareness and education related to the fresh water resource. Visitors fishing the rivers of New Brunswick are required by law to be accompanied by a qualified local guide. Camps usually hire the guides and take pride in the quality of the service that they provide to their guests. Unlike most large salmon rivers, the Miramichi is easily tackled with a single handed rod because that is the ideal choice for dry fly and bug fishing, very important methods here. And so trout fishermen capable of using an #8 rod of 9 foot or longer will cope with the river well. However, if you do use a double handed rod, you will find that during periods of high water or during certain times of year, the advantage is yours. 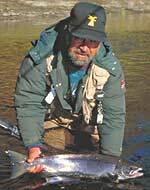 Unusually in the salmon world the Miramichi has a "black salmon" season (kelt fishing) during the springtime. In June the first of the bright salmon arrive and spread quickly through the river. Come midsummer, rising water temperatures will force the salmon to seek out cold water pools where springs or brooks maintain suitable temperatures locally. At this time, stretches of the river without cold water pools are probably devoid of fish and this is an important influence on choice of venue during warm months. October is the prime month, the first frosts and the onset of colder weather should have reduced the water temperature. With any luck rain will have raised levels after the summer droughts and strong runs of salmon will be heading upstream eager to take the angler's fly. Mentioning flies reminds me that like many important salmon rivers, the Miramichi is closely associated with many popular salmon flies some of which were invented thereabouts and others have been adopted by its anglers. The list of patterns to have in your box must include Green Machine, Butterfly, Silver Rat, Undertaker, a selection of brown and green bombers and last but not least Ally's Shrimps, reputed to be the World's most successful salmon fly. I have first hand knowledge of the Miramichi and several of its camps and would be pleased to pass on advice, arrange contacts or organise guided trips for you to visit this fantastic river. For enquiries about fishing in New Brunswick please contact me by e-mail or phone +44 (0) 1796 473718. The zero in brackets must be used instead of the international code for calls within UK, it must not be used from international addresse.